Roller chain drives are a standard means of mechanical power transmission. Sprockets are similar to gears insomuch as the number of teeth matters and they are available in bossed or un-bossed (plate wheel) forms. As with your steel gears, you need to keep your chains lubricated in operation. Sprockets should be accurately aligned in a common vertical plane, with their axes parallel. The chain should be kept clean and well lubricated. The chain should wrap at least 120° around the drive sprocket, which requires a ratio of no more than 3.5 to 1; for greater ratios, an idler sprocket may be required to increase wrap angle. Sprockets should be as large as possible given the application. The larger a sprocket is, the less the working load for a given amount of transmitted power, allowing the use of a smaller-pitch chain. However, chain speeds should be kept under 1200 feet per minute. We are one of the leading manufacturer & exporters of Roller Chain Sprocket. 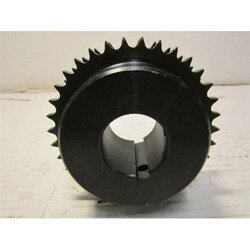 We are one of the leading manufacturers & exporters of Chain Sprocket for industrial conveyor use.